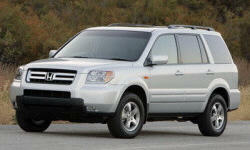 Honda Pilot Driving Position & Visibility Pros and Cons | Page 1 of 1 | Why Not This Car? Great view in all directions. The seat raises and lowers enough to make it feel like a car one day and a truck the next. The wife especially likes the higher driver position for a commnding view of the road and visibility of surrounding traffic. The seat is very comfortable and visibility is very good - better than the minivan we are changing from. High seating-great all around vis. Driving position is upright and all the windows make it easy to see what is around you.